Experience bush rugby at its best! Play for fun or get serious and try out for representative honours. Central North Rugby includes centres in Northern inland NSW, from the Upper Hunter to the Queensland border. It’s safe, well organised and suited for players of all levels. Competitive but fun; serious but social. And all of this on a background of town and rural life in country Australia. Whether it’s playing, coaching, refereeing, spectating or supporting – you will love it. Central North Rugby is administered by an efficient committee and provides two tier, high standard competition for clubs fromMoree, Narrabri, Gunnedah, Quirindi, Scone, Tamworth, Tamworth Pirates, Barraba, Walcha and Inverell. Our competitions run from April to September. They’re robust but friendly and clubs always are seeking players from around Australia and overseas. Remember, this is Bush Rugby. After each match and during the week our clubs are the social hubs of country life, especially in towns on cold winter nights. So, come on. Get to know us. Contact CNR or, better still go straight to the club in your nearest centre. 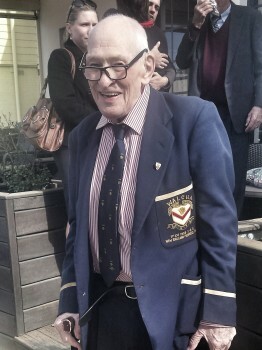 Doug Laurie - Walcha rugby legend wearing 1953 NE Premiers jacket. Pocket designed by life member Jim Ryan - deceased May 2015.